Mitsubishi Chemical Advanced Materials’s strategy is based on the broadest portfolio of polymer-based materials and polymer conversion technologies to provide the best solution to customers. Inspired by the challenges of design engineers in various industries we continuously work to rejuvenate and expand our capabilities by developing new materials and improved processes. In this context innovation is seen not only as a key driver for growth but also as a core competency allowing us to form collaborative partnerships with our customers. 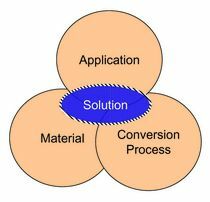 In many cases it is the creativity in selecting existing materials in conjunction with existing processes that leads to excellent solutions. If the existing offerings don’t suffice Mitsubishi Chemical Advanced Materials is using its global network of internal and external experts to find the best answer – may it be a new material, a new process or the combination of the two. Usually this happens in close development collaborations with key customers. Consequently, R&D activities are closely aligned with market requirements. The emphasis on good Research as an integral part of Mitsubishi Chemical Advanced Materials’s business model has inspired the creation of the Mitsubishi Chemical Advanced Materials Award. Less focused on operational business challenges, this award supports Mitsubishi Chemical Advanced Materials’s ability to foster its network in academia and to stay in tune with latest developments that might become valuable to our customers in the future. In addition to our academic network we have unprecedented access to the development resources of Mitsubishi.Not being focused on few specific materials, we have the freedom to choose the best option for the application. This makes Mitsubishi Chemical Advanced Materials not only an independent consultant of our customers but also an important partner for suppliers of resins and special additives. Contact us to share your unmet material needs and use Mitsubishi Chemical Advanced Materials’s unique network!